2003 Stratos 18XL 2003 Stratos 18XL 2003 Stratos 18XL Dual Console with a Mercury 150 EFI Equipment INCLUDED in this Package:2003 Stratos 18XL in Good ConditionGunmetal / Silver / Royal Blue PinsMercury 150 EFI with BRAND NEW PowerHeadOne Year Warranty on New PowerHead8’ Pro Series Power PoleDual ConsoleLowrance X49 Depth/Fish Finder In-Dash at ConsoleLowrance Elite 5x HDI Color Depth/Fish Finder In-Dash at Bow w/ Sonar & Down ImagingMinnKota Fortrex 80 24v Trolling Motor w/ 80lbs ThrustCustom Matched Stratos Trail Single Axle TrailerAluminum WheelsTrailer BrakesMatching Spare Tire w/ CarrierOn-Board Battery ChargerBike Seat w/ Pro PoleFolding Fishing SeatRatchet Style Trailer Tie-DownsHot FootKeel GuardFull InstrumentationCustom CoverAerated LivewellJack PlateStainless Steel PropBatteries, Fire Ext, Throw Cushion, Motor Toter, Etc… ALL INCLUDED!! 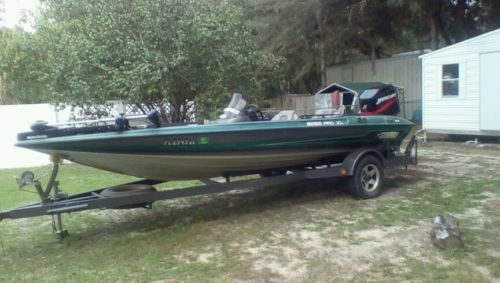 Up for sale is 1995 stratos bass boat with a 200 2.5 carb engine mercury.Boat is equipped with twin 15 gallon fuel tanks, boat overall just needs minor tlc but is water ready like it is!Has a 65 pound thrust foot controlled trolling moter ran by two new marine batterys. Boat runs great never had a problem with it,runs consistant at 67 mph with a tournament load.All gauges work besides the water pressure gage(does have a engine temp gage) could use a top coat, and a wind shield. boat has new carpet, trailer is in good condition. Clear Florida title. 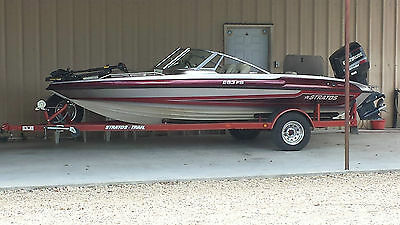 This is a 1998 Stratos, 283FS, 18FT . The boat is in great shape and has a matching Stratos trailor new tires 2 months old ,The motor was just rebuild at a local shop over $3200.00 spent on a powerhead. I had everything changed in the motor , including all new carb. kits (6), New Water pump , all filters. The motor motor run great .The finish on the outside of the boat is in great shape for the year of it . (you see by the pictures) The interior is still in good shape ,has one scuff on the passenger seat (left side). Other than that all in good shape. 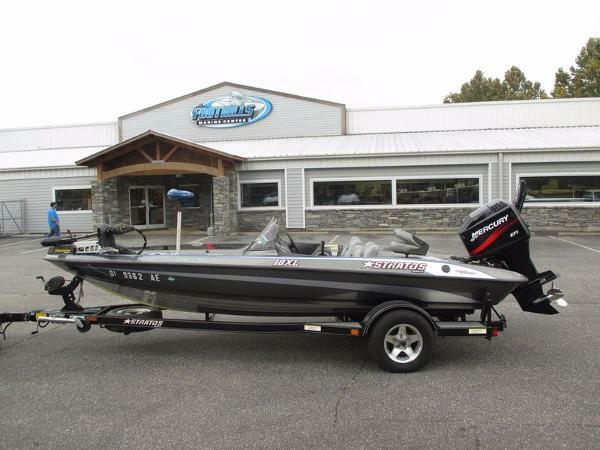 It has a 6 disc CD player (Alpine) ,2 live wells work perfect , Has 24volt 70lb trolling motor, build in Pro Mariner 3 Bank Marine battery Charger. It has 2 covers for it ,1 is a storage(not shown) and one can be left on it while be pulled (Shown on it). Selling it to get bigger boat.